Boston Police officer Steve Horgan celebrates as Detroit Tigers' Torii Hunter falls over the right field fence into the bullpen trying to catch a grand slam hit by Boston Red Sox' David Ortiz during Game 2 of the American League baseball championship series Sunday, Oct. 13, 2013, in Boston. Boston Police officer and Red Sox "bullpen cop" Steve Horgan has reportedly announced his retirement. 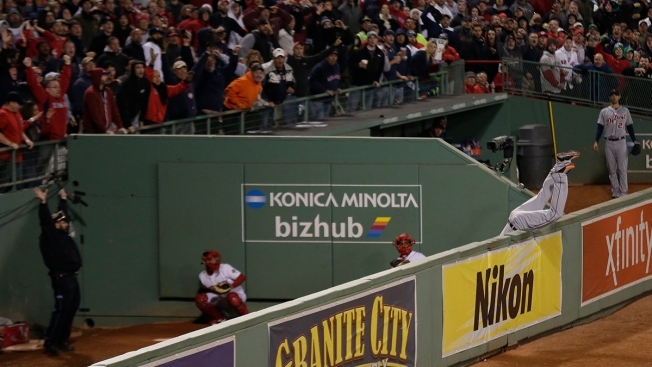 Horgan became a fixture in Boston after he was photographed with his arms in the air celebrating David Ortiz's game-tying grand slam in the eighth inning in the 2013 AL championship series against Detroit. Horgan was so excited, he didn't even see that Tigers right fielder Torii Hunter had flipped over the bullpen wall and was trying to rob the home run. Horgan told the Boston Globe he will retire in January 2019, making this year his last season with the Sox. The 33-year veteran told the paper said he would like to pursue cooking after his retirement.